since the homemade version of just about anything is better than the store-bought version (in my opinion), i decided to give caramel corn another try. so, instead of making a huge dessert for the super bowl this weekend, we decided to make caramel corn. both ryan and i were pleasantly surprised by the outcome! it was really good! i'm warning you, it is completely addicting. it's dangerous, especially considering how easy it is to make. 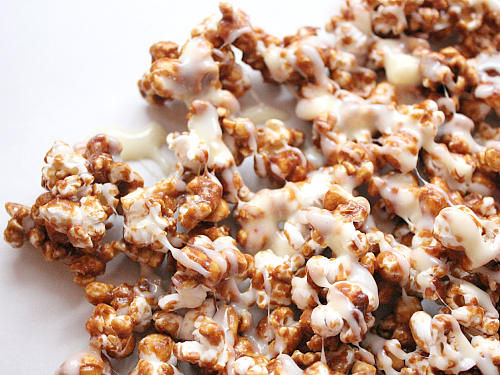 we decided to drizzle some melted white chocolate over the top of the caramel corn for some extra pizzazz. if you don't eat all of it by yourself, this would make a great gift for someone! put it in an airtight container with a ribbon and a label, and it would be so cute. you can store it for up to one week. preheat your oven to 250 degrees F. using an air popper, pop the popcorn into a very large bowl. be sure to remove any unpopped kernels from the bowl. in a medium-size sauce pan, melt the butter over medium heat. stir in the brown sugar and the corn syrup. bring the mixture to a boil and allow it to boil for 4-5 minutes without stirring. remove the mixture from the head and add the baking soda and vanilla. stir until the mixture is thick and glossy. pour a third of the caramel sauce over the popcorn and toss the popcorn. 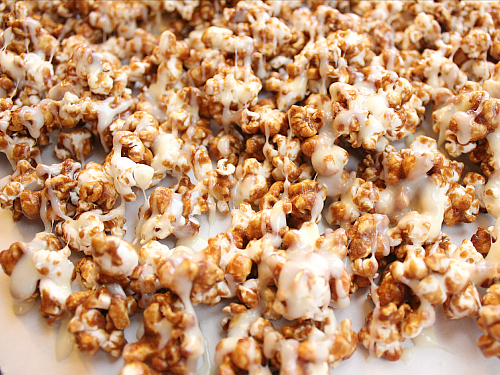 gradually add the remaining caramel sauce and toss to evenly coat the popcorn. line a large baking sheet with aluminum foil and butter the foil. evenly spread out the popcorn on the baking sheet. bake for 1 hour, stirring the popcorn after evey 15 minutes. once baked, allow the popcorn to cool completely. melt the white chocolate in a double boiler. 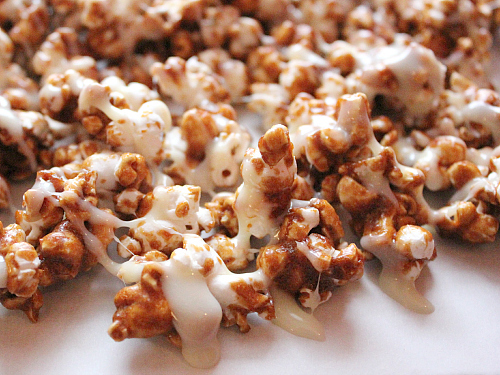 once melted, drizzle the white chocolate over the popcorn. allow the white chocolate to dry and to set up. store the popcorn in an airtight container at room temperature up to one week. 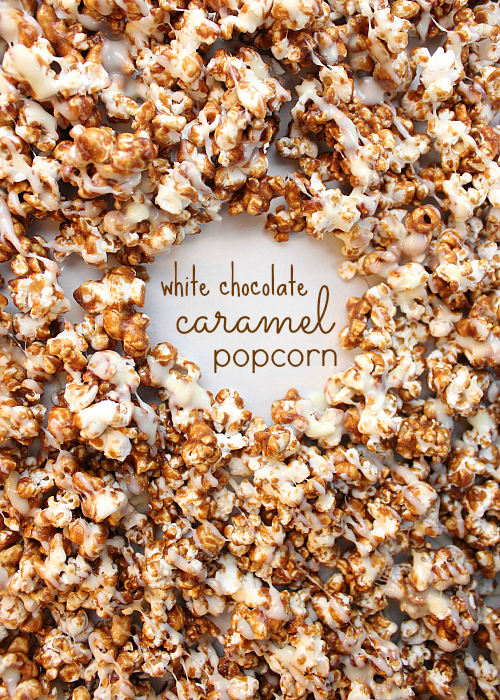 This looks really yummy and I like your first photo with the writing inside the open space in the popcorn. Your photos are just as good as the ones seen in fancy magazines! I love caramel corn. When I was young the town where I lived had a store named The Caramel Corn Shop. They had the best caramel corn and looked forward to getting it when we went into town.